Automation Engineering, reorganized under new ownership in 2011, continues to maintain the premium standards established over the 35 years the company has been in business. Time honored practices of exceptional customer service, experienced personnel, and a commitment to quality make us the leaders in automated assembly and testing systems. If your manufacturing or distribution operations need increased productivity, quality testing, or computer controls, let us put our winning combination to work for you. Our Engineering experience totals 416 years with an average of 15.4 years industry specific experience per employee. 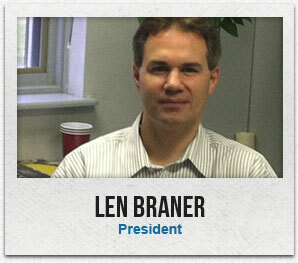 Len is an experienced leader with a proven record of success in automotive manufacturing and entrepreneurship. His varied knowledge base makes him an expert strategist and creative problem-solver. Len holds Bachelor’s degree in Business Management with concentrations in Manufacturing Engineering and Finance. Len and his wife, Jennifer, have one daughter, Katie. In his spare time, Len likes to travel and pursue his interests in American Muscle Cars.